I am currently equipped with two 4K digital still and video cameras. You can book me with confidence knowing that I will provide your content in a professional matter catered towards your needs. 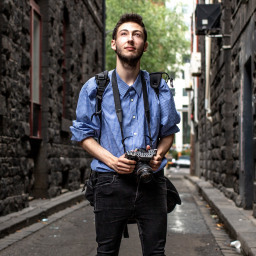 "Freelance Videographer And Photographer In Melbourne, Australia"
Thomas T. said “Tim is a truly fantastic photographer who really captured the energy and atmosphere at my event. All photographs were perfectly lit and framed. Tim was great at giving my guest and I directions before each photo was taken, ensuring we all looked good!! Kirsten E. said “Tim went over & above, helping me with equipment needed for the job. Drea B. said “Great job! easy to communicate with, punctual, flexible and delivered high quality footage. Parveez S. said “Tim was great! Arrived on time and was easy to work with. Joel P. said “Tim was great, helped me with everything I needed. Would defo use again. Brian B. said “Tim was very amenable and a pleasure to deal with. He understood my concerns and I look forward to seeing his final product. Beth H. said “Tim was really lovely to deal with, very prepared on the lead up to the event and very professional on the day. Colleen O. said “Tim just got on with what he had to do with not a lot of direction. Lachlan V. said “Couldn't be happier with how helpful Tim was and how the video turned out!